Alright bear with me - I'm fairly sure there is some moss up in there. 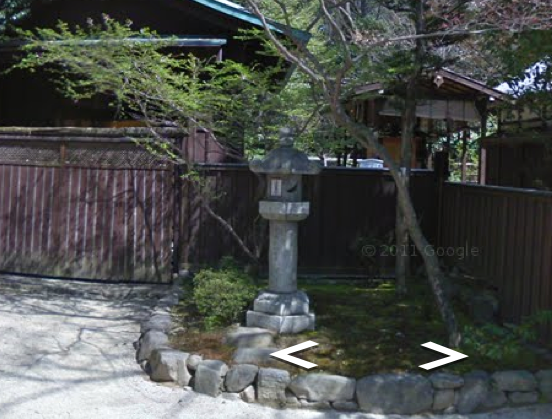 This is a screenshot from Google Maps' World Wonders Project - which allows you to explore cultural sites around the world using Google Maps' now familiar street view navigation. By pressing the arrows you advance through the scene. It can be a bit tedious to orient the "view" where you want or to determine at which points you can actually advance "deeper" into the scene. Some of the recordings of locales only give you the view from the actual street - a drive-by tour if you would. However the site depicted above, the Shimogamo Shrine in Kyoto, allows you to scoot around the grounds as though on a walking tour. Google, please make these for some botanical gardens! In high def please.